Force Majeure (French for “superior force”), is a common clause in contracts which essentially frees both parties from liability or obligation when an extraordinary event or circumstance beyond the control of the parties, such as a war, strike, riot, crime, or an event described by the legal term “act of God” (e.g., flooding, earthquake, volcano), prevents one or both parties from fulfilling their obligations under the contract. We had experienced a typhoon Ketsana that hits our area tremendously last Saturday morning since then our power was cut due to heavy rains and floods. Floods were everywhere including in our home. Power was restored last night. In this regard, the two accounts were not able to finish the working hours load for the week. Rest assured this week, we will continue to post quality deals and able to finish work load. I apologize for this unavoidable circumstances. Please explain to me how the production environment does not match what is in UAT. This is unacceptable and must stop. This is not the first time a production turnover did not match UAT. We need to review our build, turnover, and documentation procedures. This pattern cannot continue. If you are in business of delivering software as a service or similar to it the chances you will have the following environments: development, QA, staging, production, disaster recovery. You may also have dedicated environments including Build, UAT, Sand Box(es), Performance Lab, etc. If you work with offshore team the chances are some of those environments are duplicated in the offshore offices. I finally started working in my new role, VPE / CTO of PDR Network. It took almost a full year of non-stop activities on two complex M&A projects to get to this point. Medem and its assets moved on to two different organizations and I followed one of those assets. “Asset” in this case meaning product, resources, customers, etc. – basically a business unit. Fortunately, I was able to keep some of my top contributors even though far not everyone. This economy put a huge strain on teams. I had to let go some people who I immensely respect and enjoy working with. Hopefully the new place will provide an opportunity for some of the guys I lost along the way to rejoin. 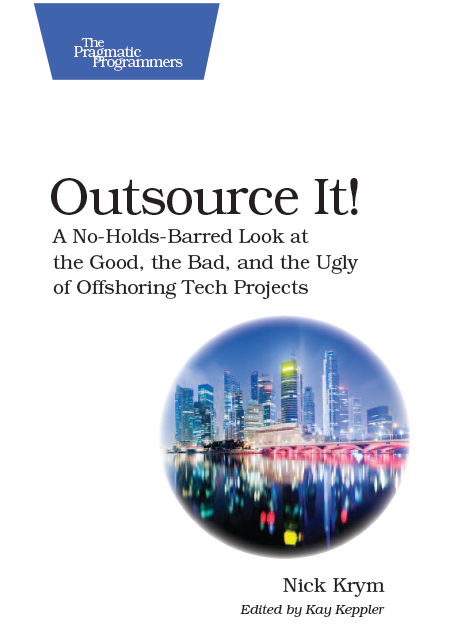 Well, it remains to be seen; at this point I am facing couple disentanglement and technology merge projects that include working with new offshore partners. PDR Network was formed by merging two assets acquired by a prominent equity firm: Physicians’ Desk Reference, acquired from Thomson Reuters, and the Health Care Notification Network, acquired from Medem. Medem had its offshore partners and Thomson Reuters many of their own. Naturally Medem partnered with small companies and TR with fairly large ones, even though to my surprise not tier 1. At this point I do not know practically anything about my new outsourcing partners and the challenges they will bring. It feels like you are standing in front of doors to someone’s house and ringing the door bell. From behind the doors you hear a dog barking. What kind of dog is it? Playful Yorkshire terrier, English Bulldog dripping saliva, huge Newfoundland eager to lick you off your feet, vicious Presa Canario ready to rip you apart? It would be great to know before the door opens. OK, that’s enough for now. I will keep you posted with what I find out discover over next few months. You most likely have seen that commercial. I think EDS has a great point here, managing software organizations is very much like herding cats. Managing software teams with outsourced distributed components take herding cats to a profoundly higher level – doing it on steroids… or should I say on drugs? How can one survive the ordeal of getting a product out in multi-sourced distributed environment? Language barriers alone brought the Babel project to its fiasco. And you know that language barrier is often much easier to deal with than with communication barriers or cultural differences. Casting. That is the first and the most important element – select right tools for the job, find the right providers for the task, put people in positions that match their skills and aspirations. Compensation. Make sure that resources on your project are properly compensated for what they do, that applies to everyone from your in-house architects to offshore worker-bees. Considering that working with offshore throws a huge monkey wrench in your ability to control compensation you may need to start early – when establishing your relationships with providers. Communications. Put a well thought out communication plan in work and enforce it with the vengeance, at the same time review it and improve with every opportunity. Make sure that you cover all channels and take advantage of multiple media. Culture. Cultural differences derailed many projects and engagements. At the same time it is not necessarily as difficult or complex of an issue. Here are just a few things consider – acknowledge / recognize cultural difference, educate the team about them, and keep attention on cultural aspects, in particular when it comes to communications, estimating and delivery patterns. Control. Control execution on an ongoing basis in every aspect of the project – schedule, budget, quality. That is a large topic partially covered in the blog already (see for example Peace in Metrics). I will talk more about it in future posts.